Here's a quick Valentine for two challenges. First, I used the Freshly Made Sketch#71 here. And second, I used the SUO Challenge#63 here. It's to make a clean & simple Valentine. 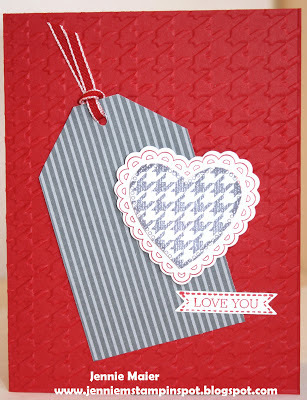 Hearts a Flutter, Itty Bitty Banners and Beyond Plaid are the stamp sets. There's a bit of Neutrals DSP Stack. And I ran the Real Red base thru the Big Shot with the Houndstooth embossing folder. This birthday card uses a sketch and a color challenge. First, I used the MojoMonday Sketch#278 here. And second, the Splitcoast Color Challenge#411 here. The colors to use are Daffodil Delight, Lucky Limeade and Island Indigo. Bring on the Cake and A Fitting Occasion are the stamp sets and there's some Summer Smooches DSP and some '12-14 In-Color DSP Stack. 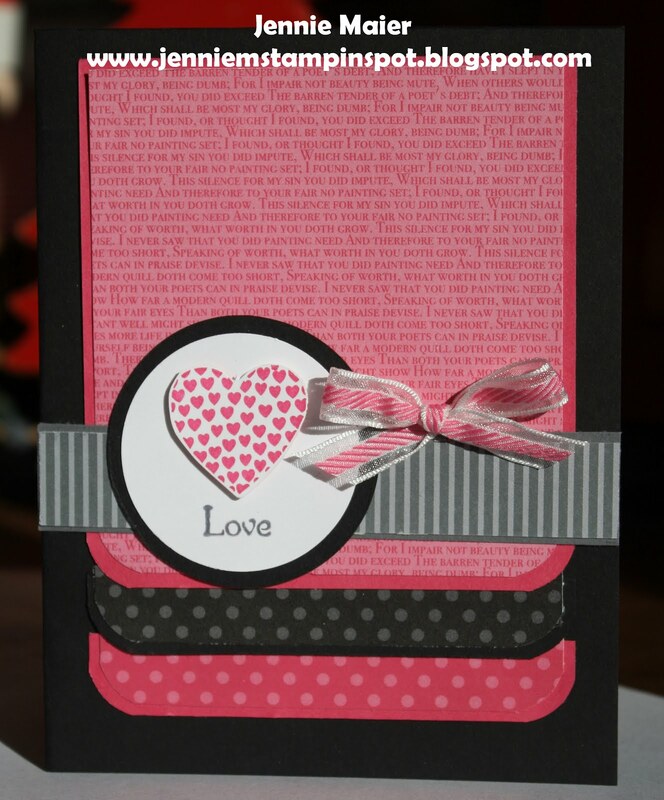 I made this card for the Clean & Simple Stamping FTL#224 here. 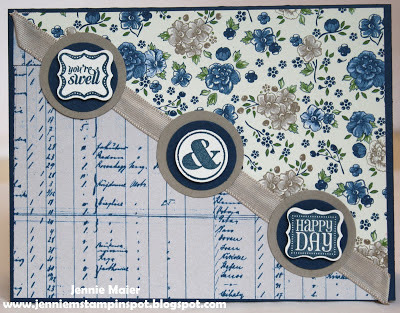 The stamp sets are Printed Petals and Itty Bitty Banners and the DSP is Summer Smooches DSP. 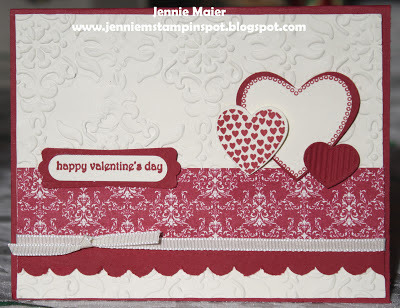 Here's a quick card for the Create With Connie and Mary Challenge#236 here. The colors to use are Raspberry Ripple, Lucky Limeade and Pretty in Pink. I used a piece of the Print Poetry DSP for the background and then stamped the images from Artistic Etchings. I added some ribbon and flowers punched with the Itty Bitty Shapes Punches pack. Here's a quick, masculine Valentine's card using the MojoMonday Sketch#277 here. I used the Beyond Plaid stamp set for the red pattern part and the Got Treats stamp set for the other panel. 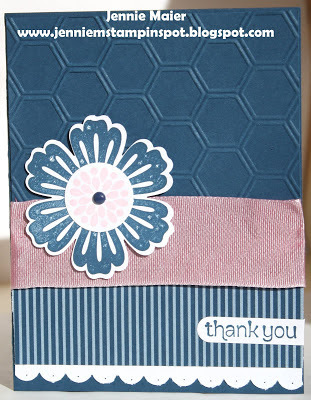 And I ran some Basic Gray card stock thru the Honeycomb embossing folder. 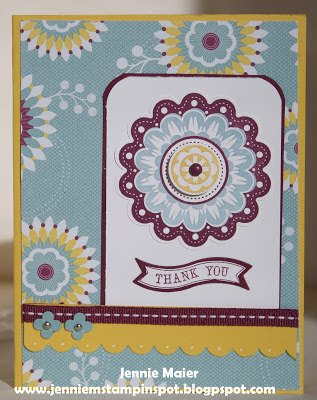 This thank you uses the Clean & Simple Stamping FTL#223 here. The stamp sets are Happy You and Itty Bitty Banners. And there's some Print Poetry DSP. I made this card for two Splitcoast Challenges. First, I used the Color Challenge#410 here. The colors to use are Calypso Coral, Pool Party and Soft Suede. And second, the Splitcoast Sketch#420 here. Hearts a Flutter and Ciao Baby! are the stamp sets and the DSP is from the "12-'14 In-Colors DSP Stack. 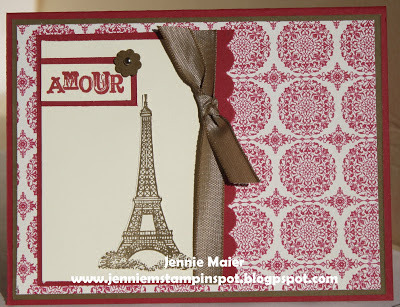 Stamps: Hearts a Flutter and Ciao Baby! This card came together quickly thanks to the Freshly Made Sketch#70 here. 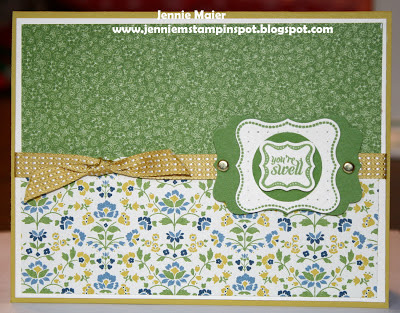 Betsy's Blossoms and Embellished Events are the stamp sets and there's some Floral District DSP. 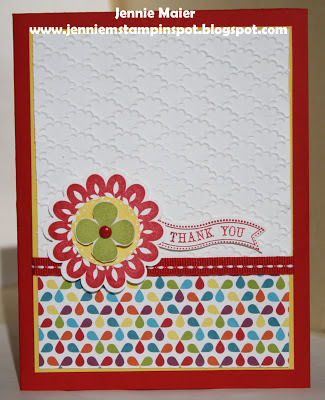 Sale-a-bration starts today so I used the adorable Sycamore Street DSP on this card. I also used the Create a Cupcake and Ciao Baby! stamps sets. Don't forget you get a free Sale-a-bration item for every $50 you spend now thru March 22nd! Stamps: Create a Cupcake and Ciao Baby! This card is for two challenges-a sketch and color combo challenge.I used the Create with Connie & Mary Challenge#235 here, and the FabFriday Challenge#10 here. The colors to use are Cherry Cobbler, Pool Party, Pink Pirouette, Very Vanilla and Crumb Cake. 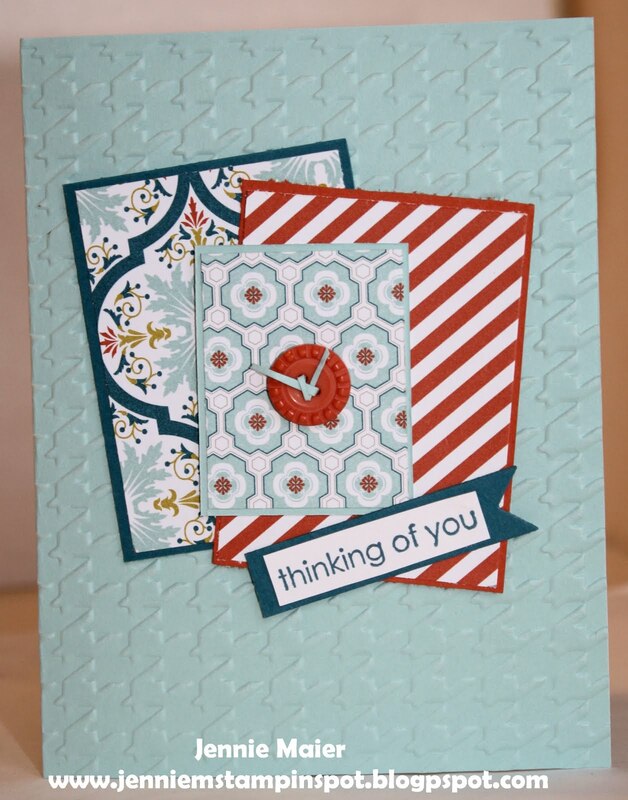 Thoughts and Prayers is the stamp set with some Sycamore Street DSP-available tomorrow! Only a few days until Sale-a-bration! 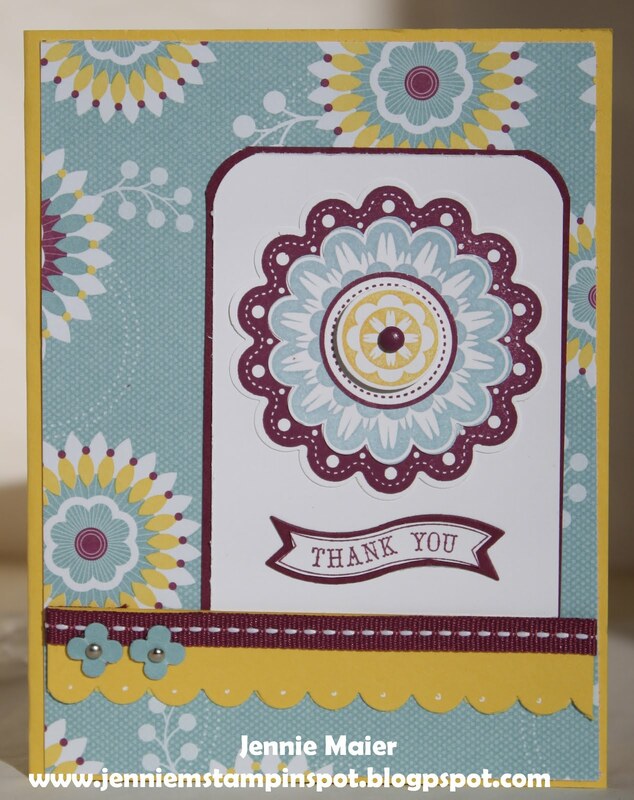 I used the Sycamore Street DSP and Button on this card. Also, I used the Splitcoast Sketch#419 here. 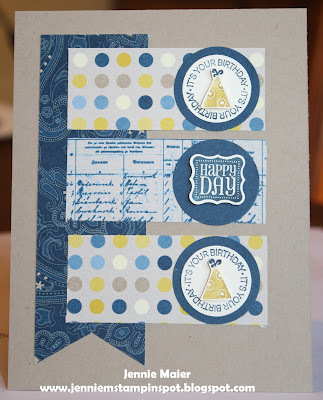 Embellished Events is the stamp set. 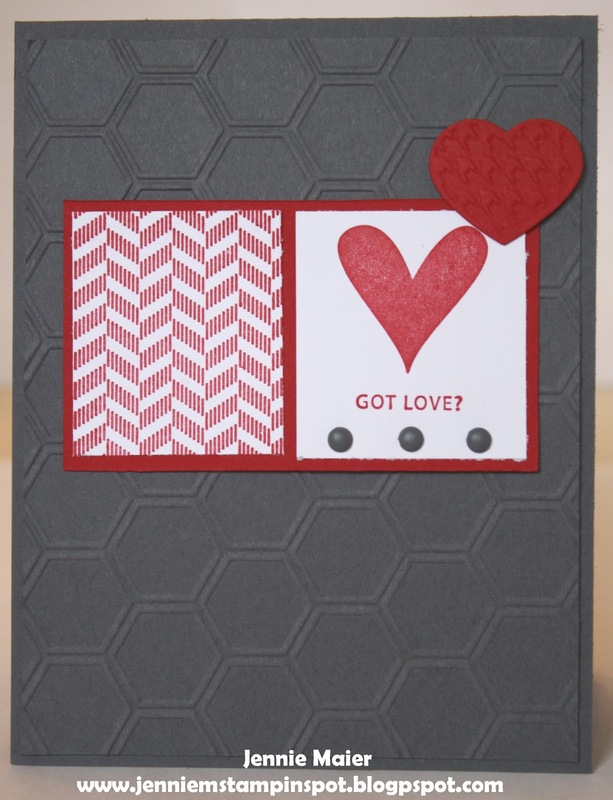 And I used the Houndstooth embossing folder and the Bitty Banners framelits. Here's a card for the Freshly Made Sketch#69. Ciao Baby! is the stamp set and there's some Print Poetry DSP. This card uses a color and sketch challenge. First, I used the Splitcoast Color Challenge#409 here. 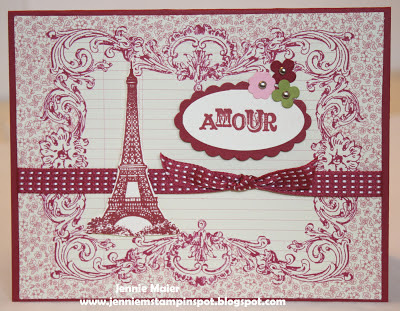 The colors to use are Rose Red, Pink Pirouette and Wisteria Wonder. And second, the MojoMonday Sketch#276 here. Hearts a Flutter and Delightful Dozen are the stamp sets. And there's some First Edition Specialty DSP and some Floral District DSP. 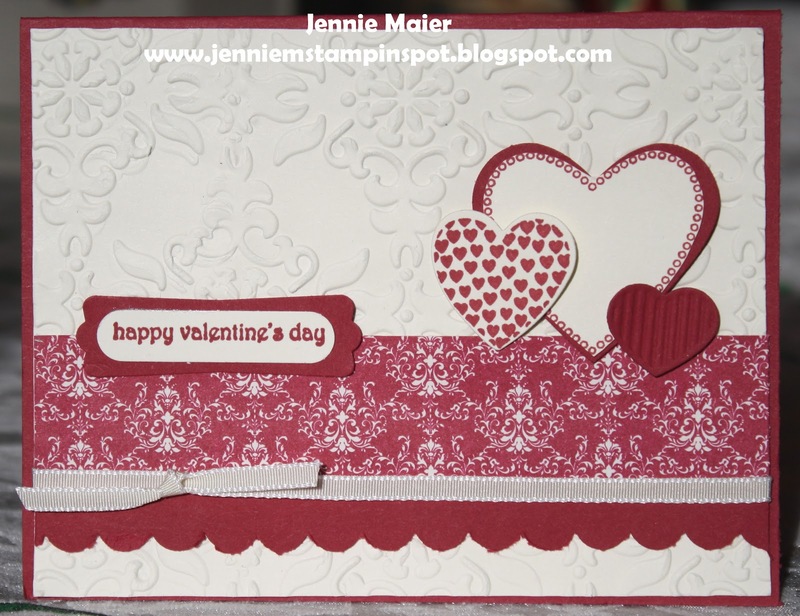 I used the Stampin' Celebration Inspiration Challenge#62 here for this Valentine's Day card. The red in the cocoa popped out to me so I used that as my main color. I used the Hearts a Flutter stamp set and matching Framelits. 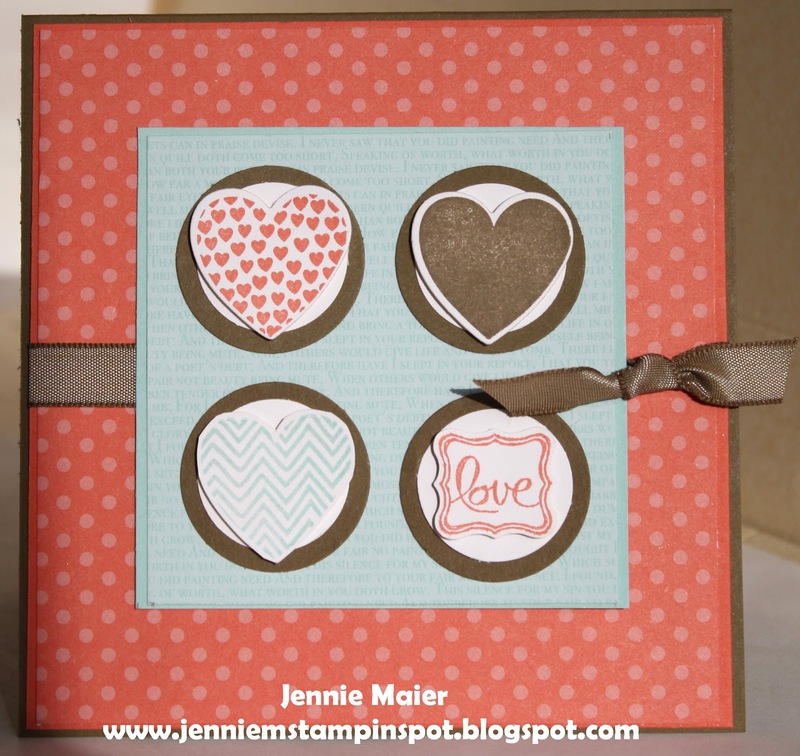 I also used the Fashionable Hearts embosslits for the little dotted heart and the Delightful Dozen stamp set. The DSP is from the Twitterpated DSP. 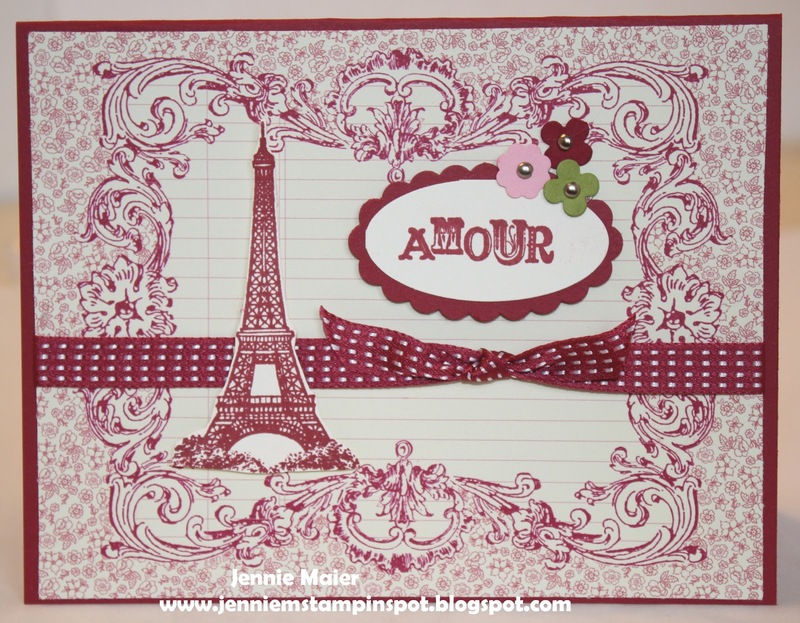 I used the Create with Connie and Mary Color Challenge#234 here for this card. The colors to use are Pink Pirouette, Midnight Muse and Whisper White. The stamp sets are Mixed Bunch and Made for You. 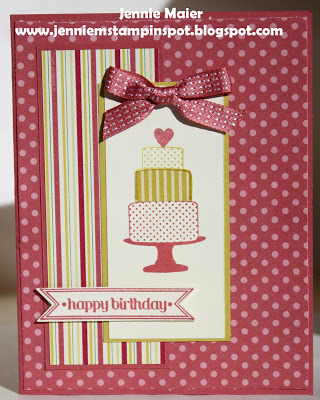 I used new items from the Spring Catalog too-the Honeycomb Embossing folder and some 1 1/4 inch Pink Pirouette/Rose Red Two-Tone Ribbon. I used the FabFriday Sketch#9 here for this birthday card. Made for You is the stamp set and then there are some Sale-a-bration goodies: Sycamore Street DSP and the Petite Curly Label punch. 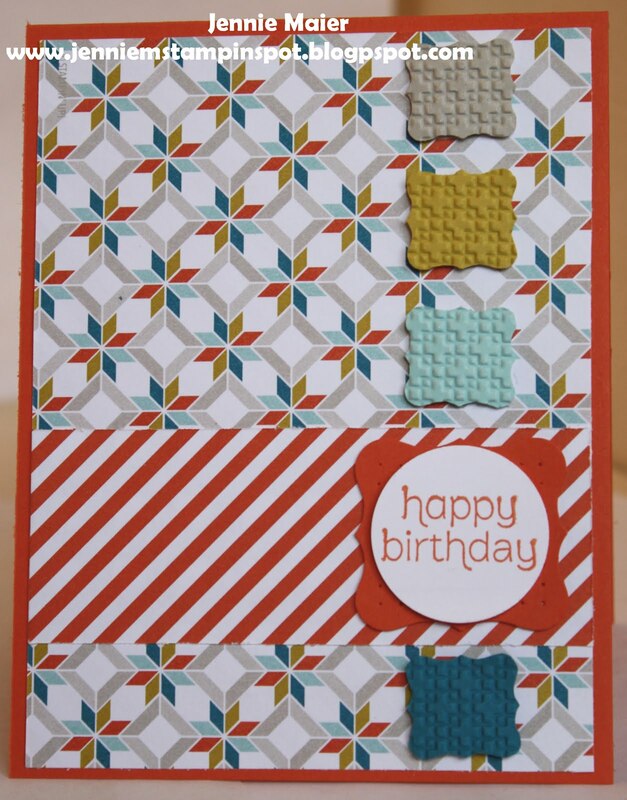 I ran the punched pieces of card stock thru the Big Shot with the Square Lattice embossing folder for some texture. This birthday card was made using the Splitcoast Sketch#418 here. 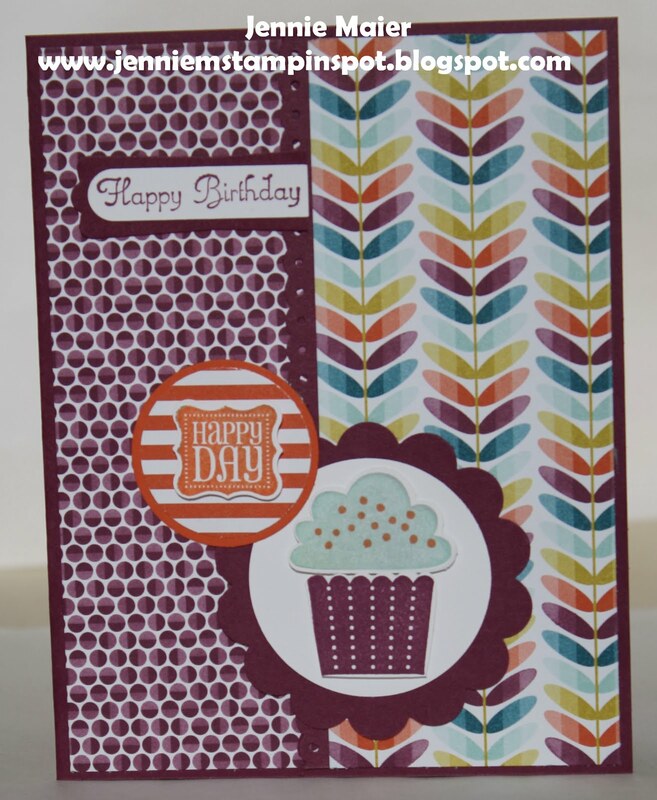 The stamp sets are Make a Cake and Itty Bitty Banners and the papers are Print Poetry DSP and some "12-14 In-Colors DSP Stack. This thank you card uses the Freshly Made Sketch#68 here. 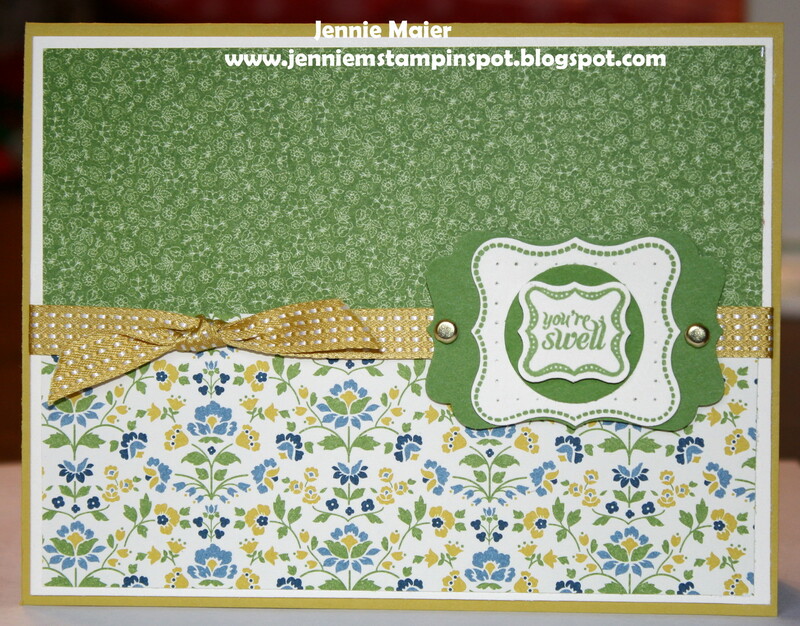 It also uses the Quint-Essential Flower stamp and Itty Bitty Banners stamp set. And there's some Floral District DSP. I made this card for a color and a sketch challenge. First, I used the Splitcoast Color Combination #408 here. The colors to use are Very Vanilla, Soft Suede and Raspberry Ripple. And then I used the Clean & Simple Stamping FTL#222 here. The stamp set is Artistic Etchings and I paired that with some Print Poetry DSP. This masculine birthday card (for my brother) uses the Mojo Monday Sketch#275 here. It also uses a new stamp set, Beyond Plaid and one of my favorites, A Fitting Occasion. 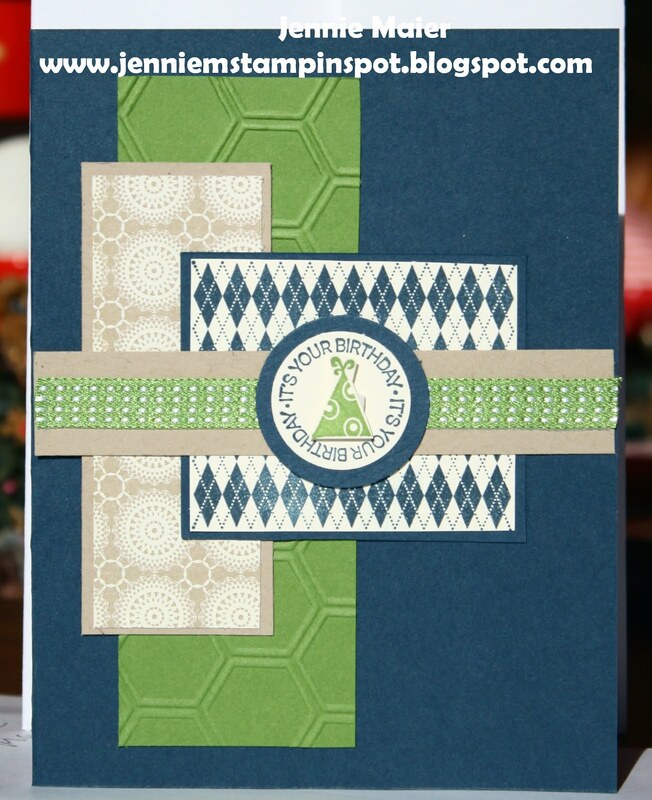 There's a new embossing folder too, Honeycomb, on the Gumball Green card stock. And more of the new DSP, Print Poetry. Here's a card for two challenges. First, I used the PPA Color Challenge#150 here. The colors to use are Melon Mambo, Basic Black and Basic Gray. And second, I used the Splitcoast Sketch Challenge#417 here. 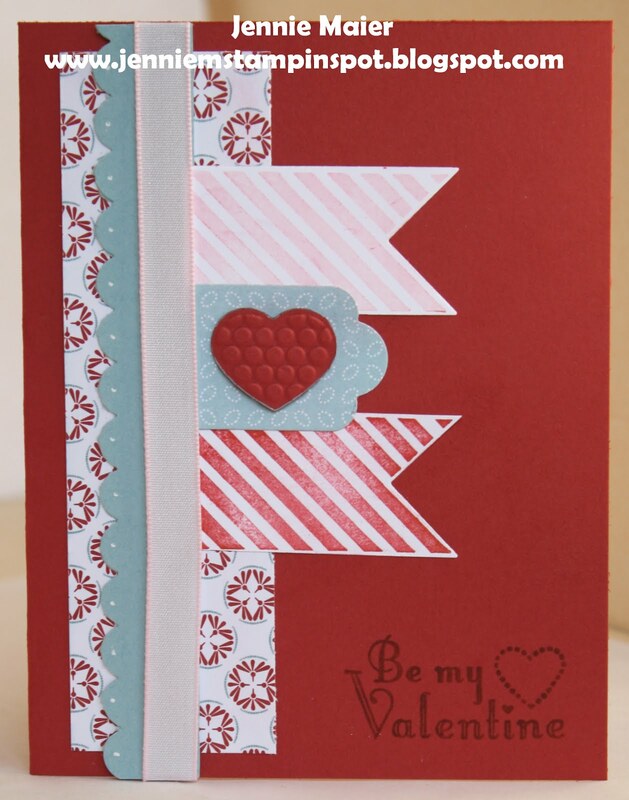 The stamp sets are Hearts a Flutter with Pennant Parade. And then there's both Neutrals and Brights DSP Stack. Since I had out the Ciao, Baby! and A Fitting Occasion stamp sets and the Print Poetry DSP, I made another card. This onecame together really quickly thanks to the Create With Connie and Mary Sketch#233 here. Stamps: A Fitting Occasion, Ciao Baby! This card uses some items now available in the Spring Catalog. I used the stamp set, Ciao, Baby! with some Print Poetry DSP. I also used A Fitting Occasion stamp set. And the Petite Curly Label punch is a Sale-a-bration item. It coordinates with the Ciao, Baby! stamp set and the Curly Label punch. 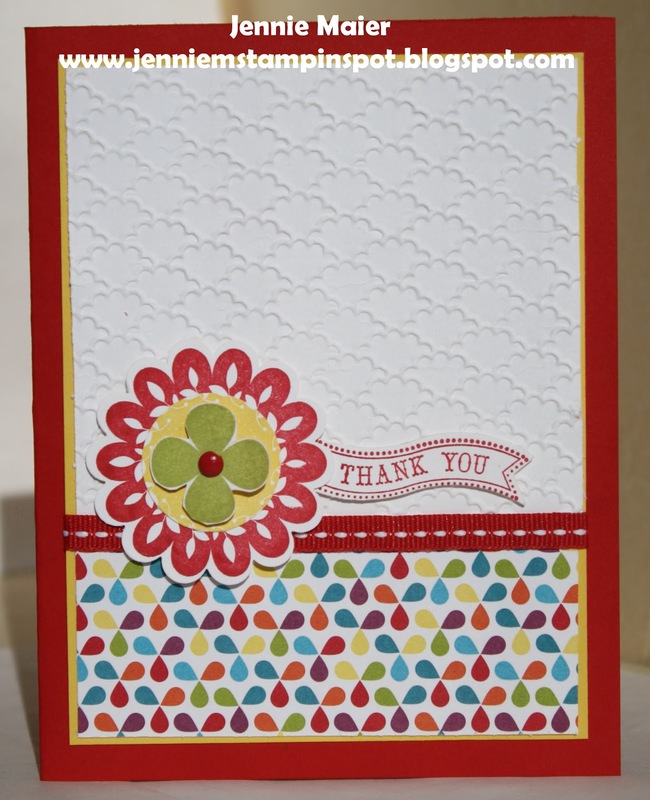 This card highlights the Sale-a-bration DSP, Sycamore Street. 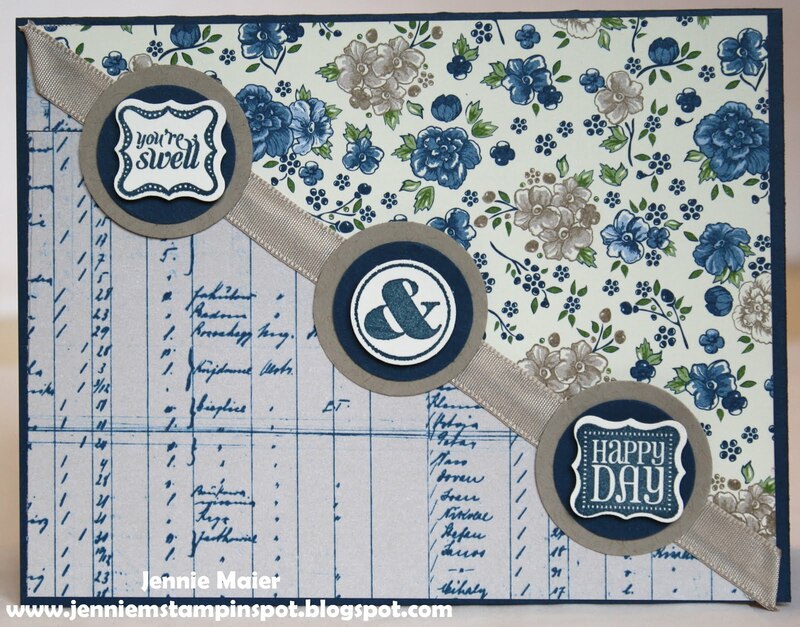 I paired it with the Moving Forward stamp set and some of the Sycamore Street Ribbon & Button Pack too. It came together quickly with the MojoMonday Sketch#274 here. It's back to reality, back to school and back to stamping for me-yeah! Hope you all enjoyed the holidays, I know I sure did. Tomorrow is the day you can order from the Spring Mini so I made a Valentine's card with some new products using the Freshly Made Sketch#67 here. 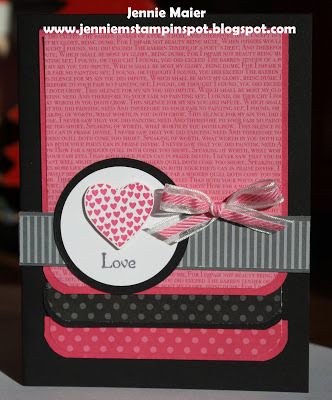 I used the Hearts a Flutter stamp set and Framelits Dies along with some Print Poetry DSP. 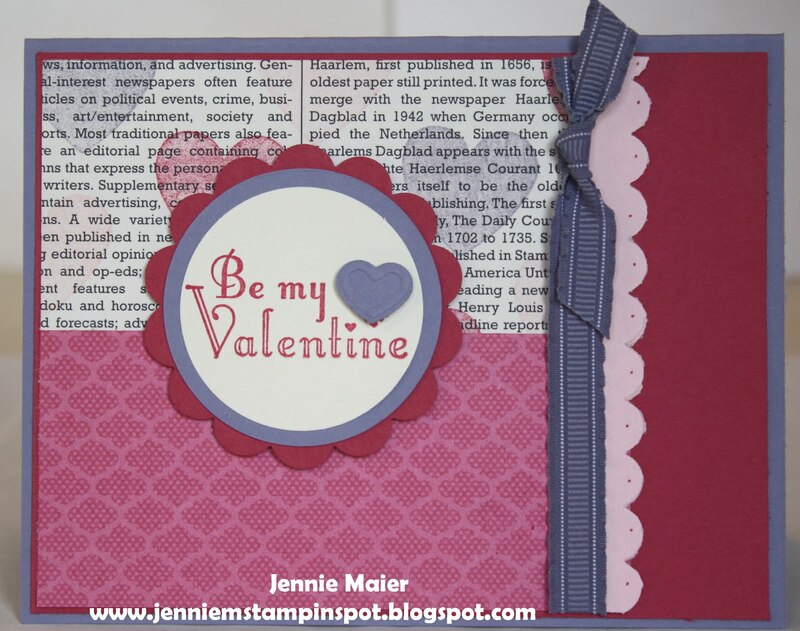 Also used the greeting from Teeny Tiny Wishes and the Fashionable Hearts Embosslits.